I’ve been a fan since I searched April on the web a few years back following the release of That’s How We Run a mind-blowing album featuring the traditional music of the US rather than her usual fare from her native Canada. It featured an A-List of players too numerous to name here but a mention of Bobby Hicks and my heroes Riley Bauguss and Dirk Powell should help to set the bar for your listening pleasure. She followed this in 2013 with another blockbuster, Bright Like Gold a twenty track beauty and I’ll just say that having Sammy Shelor, Mac Wiseman and Bruce Molsky on board may have been responsible for me almost wearing a hole in the CD from constant replaying in my car. Her latest release The Newpart will I’m sure form a goodly part of her concert material and is a tribute to her family history and that room back home that nurtured her love of all things musical and gave us the consummate musician that is today’s April Verch. She is without doubt one of the world’s best traditional fiddlers , a singer of such style that would have many of the “Chantoosies” of many a gin joint green with envy and a step dancer who can tap, clog and perform leaping twirls that put me and my camera to the pin of our collars just trying to keep up. My first live encounter with April was at last years Ulster American Bluegrass Festival in Omagh, Co. Tyrone, where she and her band entertained us over three days delivering different sets each time, winning new fans with each performance and the thing that fascinated me most was to see her join in as many off stage jam sessions as she could squeeze in. I recently asked her for her thoughts on jumping into jams and her answer took me a little by surprise. She loves to jam and will always leave having learned a new tune or song but she would never presume to upstage the jammers, preferring instead to just join in at her comfort level, admitting that Bluegrass is not her strongest genre, and enjoy the learning experience. Her dedication to improving her musical skills is summed up in this story, how years ago at a local fiddler’s monthly dance in her native Ottawa Valley, this young prodigy much loved and encouraged by the older players, noticed that when she played a waltz the dancers didn’t fill the floor even though she felt she had the correct tone and technique. Her Dad persuaded her to listen to how the older and sometimes scratchy fiddlers’ playing got the folks up dancing. That lesson lives with her today and honed her ear to the timings and traditions that move the dancing soul. April was born, resides in and returns regularly to her family home in Pembroke Ontario in her beloved Ottawa Valley. Her Mom and Dad still live in the old family schoolhouse with the Newpart extension now celebrated in her most recent CD. This is her cocoon where she recharges her batteries after her many trips abroad, topping up on the people and culture, so much a part of her young life and which she feels compares very favourably with the culture of this green and mystic isle. Her earliest musical experiences were listening to her Dad’s Country band playing at the local dance halls. Her parents were and still are huge music fans. So much so that she grew up thinking that every kid must have had the same love for music that she had right from the cradle. She was nurtured by the local musicians who recognizing the future that lay ahead of this cute but talented child prodigy, schooled her in all aspects of her obvious career. They especially trained her in the business side of a touring musician’ life to avoid the pitfalls that might take the gloss off a shining stage career. When I asked if she hated being dragged to music lessons she hesitated slightly but honestly replied that her dancing lessons came first, in group sessions which she loved. She started fiddle lessons at about 9 years old and flourished in her old timey styling but some interested observers suggested to her Dad that she was in danger of developing some bad habits and playing techniques which might be impossible to correct later. So classical lessons soon followed that although she later appreciated them, took her attention away from her preferred old time fiddle tunes. So like all youngsters she persevered and those classical lessons laid the foundation for the impeccable fiddle playing which has lifted her to the pinnacle of her profession. I was very curious as to which came first the fiddle or the dancing shoes and with a grin she referred to some old family photos that prove she was dancing before she could even walk. So she strapped on her dancing shoes to follow in awe in the footsteps of her older sister Tawnya, picking up her fiddle along the way and the rest as they say is history..
April constantly refers to the Ottawa Valley style, a culture which like many other Canadian styles is historically driven by the settlers in any region. The Ottawa Valley drew many settlers to the lumber camps from Ireland, Scotland, France, Germany and Poland. And it is that distillation like a fine blended whiskey, of all these cultures that gives rise to those hard driving rhythms with a particular emphasis on dance music. She proudly announced that the first music at a local wedding is when all the assembled guests gather for an Old Timey dance. How beautiful that must be to experience. April will be travelling with two amazing musicians and since this is an equal opportunity band you can expect full participation from all involved. Cody Walters from Kansas has been with her since 2007 and lays down a solid backbone bass but with base or his clawhammer banjo he is never too shy to step out front and entertain. Hayes Griffin joined the band three years ago and his flatpicking guitar style much influenced by his hero Tony Rice, has to be up there with the best I’ve ever heard. These guys are a serious group of dedicated musicians who constantly seek to push the envelope on their many styles by searching, listening and working together while on and off the road to bring the best they possibly can to each new audience. 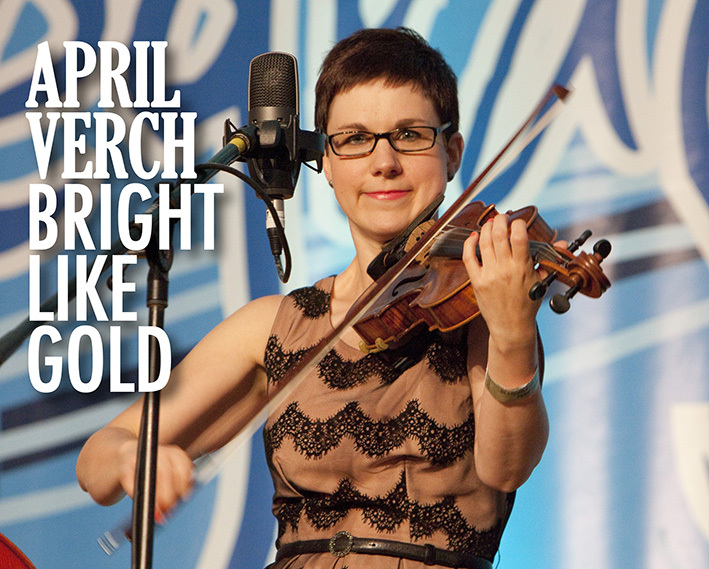 Every artist has musical heroes and April is no different. When quizzed on who would she most like to play with she had no hesitation in lamenting the fact that although she had met him a few times she never did get to play with the great John Hartford, a musicians musician who is close to the heart of all of us who love the sound of an old time fiddle or banjo. There is also a whole list of local musicians that she still has to tick off her must play with bucket list. This led to an obvious question from me as to which of her recorded projects still gives her goosebumps. Modesty again took over and she admitted to seldom listening to her previous recordings but the project that her Dad recorded and the recent albums with Sam Bush, Mac Wiseman, Riley Bauguss and Dirk Powell hold a very special place in her heart. Finally digging into her chill out time I discovered that she has stashed away a copy of Pink’s Greatest Hits that gets headphone time and an opportunity to bop away in private hoping that nobody gets to see. As an aging folkie from the 60’s I have had the chance to enjoy many live performances through the years but this little lady and her two partners on stage offer a visual and musical treat that I will value for many years to come.